earthian: Quagga: half zebra, half horse, completely extinct! Quagga: half zebra, half horse, completely extinct! Because of the great confusion between different zebra species, particularly among the general public, the quagga had become extinct before it was realised that it appeared to be a separate species. 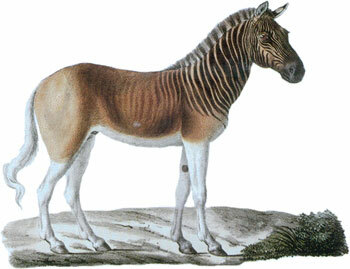 The quagga was the first extinct creature to have its DNA studied. Recent genetic research at the Smithsonian Institution has demonstrated that the quagga was in fact not a separate species at all, but diverged from the extremely variable plains zebra.